I've told you guys about the Slice app. Have you heard of Shop it to Me? If you haven't, proceed at your own risk. (read: it could be dangerous to your wallet) I've been using it now for about 5 years or so, maybe more? Basically, you create an account, input all of your sizing info, and select all the brands you love. Then every morning (or less often if you prefer), you get a personalized email showing you what's on sale. It's like a virtual personal shopper, and is much of the reason why I've said before that the majority of my purchases happen online. It's just amazing how convenient it is to shop, no matter where you are or what you are doing. I happened to be on a plane using wifi. I didn't check my email until we were just about to start our descent, but as I was scrolling down, I saw this Marc by Marc Jacobs Classic Q Natasha bag. 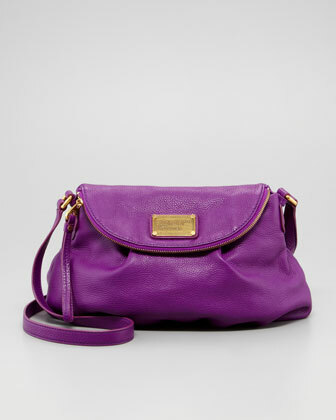 I originally really wanted this bag in cobalt, but the Kate Spade crossbody seen here satisfied that need. When it popped up in my Shop It to Me email this morning, I gasped a little. The color is so rich and saturated, it's beautiful. I took a mental note of wanting to order this bag, then kept scrolling through the rest of the email. That's when I saw these Kate Spade "Corinne" glitter pumps. My heart stopped. I had seen them before, but they were never cheap enough for me to take the plunge. When they came up as 60% off through Saks, I immediately clicked the link to purchase them. But then the flight attendants told us to turn our electronics off. Ugggh! That was the longest landing ever! Literally, the second we touched down, I powered on my phone, added the shoes to my cart, and completed the purchase before we even got to the gate. What's even sweeter is that when I went back to the link to pin the image into Pinterest, they came up as out of stock. Which means I snagged the last pair, and they were in my size. Gosh I love shopping fate. If you like these, they're on sale here, although not quite as cheap as I got them and sizes are limited. Once I deplaned, I pulled aside to order the MbMJ purse. I regretted not buying the cobalt one when I saw it on sale, because it vanished forever. It all worked out since I found the Kate Spade version that I love, but I didn't want to lose out on another one of these. I figured I would add this to my rainbow of crossbody bags. Family photo to be posted soon, I'm sure. I know, I know. I make shopping sound so dramatic and monumental. But hey, if it didn't feel like that to me, do you really think I'd have a fashion blog? DIYW on the glitter shoes!!!!!! You had me at glitter. Totally agree! I have to consciously delete the emails before opening them if I'm on any kind of shopping ban!